From the first sights of Micheal Kors collection, it was obvious it would be unlike anything I had ever seen from the designer. The major colors were black, blue and orange with many peplums and zipper accents. The models wore sunglasses and the aesthetic was powerful, strong and structured. 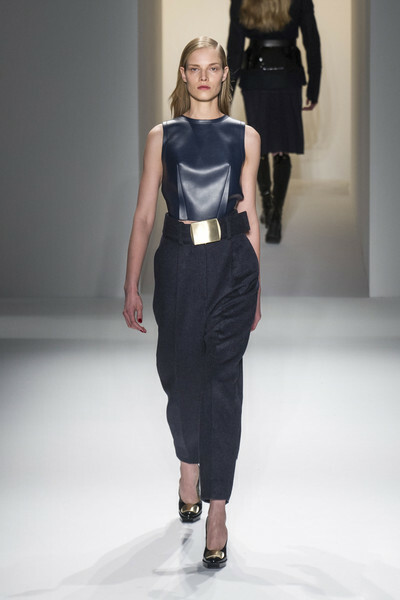 There was also a futuristic vibe to the collection with some of the peplum and cuts of the garments. Another trend that is here to stay is the hi-low which was seen in a few of the final pieces. Immediately when you see Rachel Zoe's collection, you know it's her design. Each piece that walked the runway looked like something she would personally wear herself which I appreciated. Her color choices were on point for fall and made me excited for the upcoming season. She used minimal prints but went full force with accessories by adding wide brimmed hats to many of the models. The pieces in this collection are so great because you can take a top and match it with a different pair of pants it wasn't initially styled with. Zoe's concept behind versatility is what makes this collection work really well. You can spot a piece by Anna Sui from a mile away and that is what makes her such a legendary designer. Everything from her color choices to prints scream fun, youthful and daring. I definitely sense a 1960s inspired groove within the collection due to the amount of shift dresses and types of prints. Major colors included fuchsia, orange, blue, white and purple. I'm very excited about the accessories as she included some large pendants and great quilted handbags. When I think of Ralph Lauren, I think classic American clothing and this collection certainly delivered. With cable knit sweaters mixed with leather skirts, paper boy like hats, new ways of wearing the button down white blouse and plenty of velvet, the collection is very well rounded. I appreciate that there is something for everyone in the collection whether you're going to school or going to the Oscar's. Ralph Lauren never disappoints and has definitely set the bar for Fall 2013. Calvin Klein has got you covered for Fall. With the collection ranging from beautiful jewel tone colors to winter whites, oversized belts and leather, you have every fall trend at your finger tips. The leather dresses are beautifully cut and the use of white in the collection is smart and daring- something I think we're bound to see more of in fall 2013. Navy was also a big color that started off the collection on the right note. I'm excited to see this collection on the sales floor as each piece could be a bold yet essential piece to your wardrobe.